I’m a lover of the American in-betweens – those places most travelers flyover, or on their way to somewhere else capture a zipped view that looks like a shaky panned shot with my cheapest camera. The in-betweens of our nation’s highways are destinations for me. And that includes those near and dear. 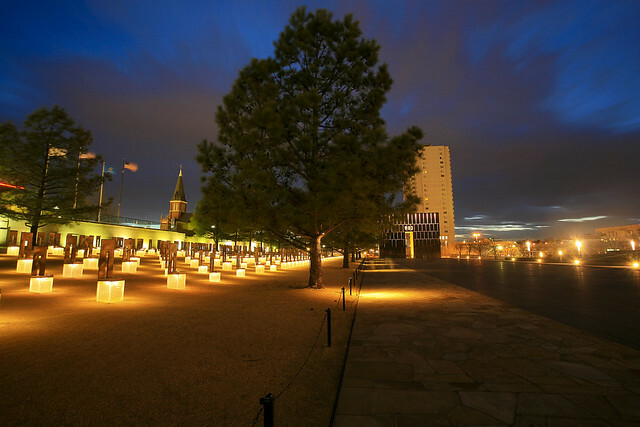 Oklahoma City’s bombing tragedy fifteen years ago headlined on the international stage and brought home the hardened truth that living on the Great Plains isn’t all that removed from the rest of the world. For the rest of the world, Oklahoma City’s tragedy had an even more broadly grim impact. If life on the Great Plains didn’t epitomize insulation and protection, then where did that leave everyone else? The ensuing and equally documented triumph, trumped the tragedy. And instilled the belief that Oklahoma City lies at the nucleus of what still makes America great. And if you doubt it, then you’ve not had a look around Oklahoma City. For there you’ll find all the appeal of a city that teeters masterfully on the fine line dividing mass produced modernity and swashbuckling American individualism. 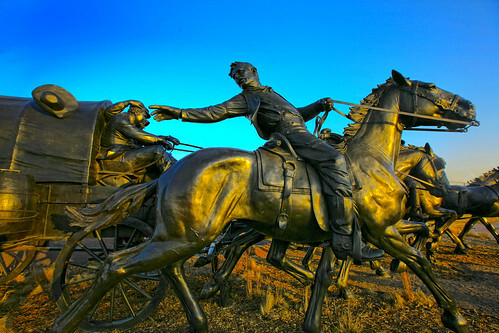 The Land Run Monument at Sunset. My people. 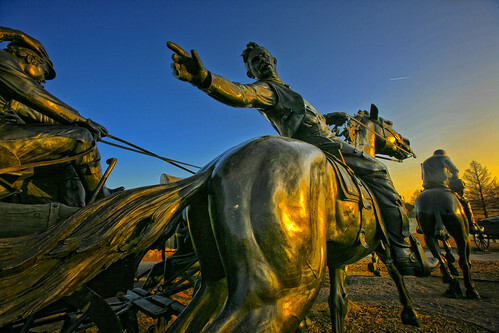 Oklahoma City was domestically settled during The Land Run of 1889. Before that it was a trading post on a vast stretch of prairie known as “the nation.” To the nation outlaws fled, Redlegs after the Civil War, and God fearing individuals with the tenacity, fearlessness and ingenuity to pound nothing into something. All converged with the Native Americans who’d been here for centuries and a backdrop unfurled for one of the fiercest mixing of cultures on American soil. Nowhere is the tumult of the early struggles captured and blended best with modern times as the concentrated area of Oklahoma City’s downtown. And maybe no time is more conducive to the discovery of the city’s unique treasures as the hours that bookend the day. So you’ve seen or heard of Bricktown. But have you walked the grounds of the Capitol at daybreak? Nosed around downtown after dark until you found the tucked away treasures of “The Curious Organism”, “1889”, and “Galaxy” sculptures? Stood in the middle of the massive Land Run bronzes at sunset imagining the choke of dust kicked up at the start? Snooped and sniffed until you stumbled upon the underground tunnel entrances? Or watched in the hushed silence of night the twinkling lights of hope that illuminate the chairs in the National Memorial? No? Then stop for a bit on your next flyover. See these photographs?? You WON’T be sorry. The Curious Organism. (hint - just to the left is an underground tunnel entrance). These restaurants top my list of places that offer a combination of fantastic food with captivating environments. Cheever’s Café. I never visit Oklahoma City without a meal at Cheever’s. If there’s no time for Cheever’s, the trip can’t be justified. Some establishments instill that sort of devotion by doing something repeatedly that few can emulate – they earn it. I have three menu favorites from which I can’t break away. The Chicken Tortilla Soup – it has no equal. During the most recent feast, the chef shared the recipe with me. I’ll share that later. The Roasted Quail Short Stack: farm raised quail layered between corn tortillas with an ancho chile sauce and Mexican cheeses, then baked and topped with avocado salsa verde. Mixed Seafood Tamales suspend large chunks of shrimp, lobster, halibut, and scallops in a handmade sweet potato masa drizzled with a sublime ancho cream. Decedent. There’s a technique to eating these – don’t be shy about asking your waiter. Portions are generous. 405.525.7007; 2409 N. Hudson Avenue, 73103; www.cheeverscafe.com. Nic’s Grill. For under $10 you’ll have the cheeseburger experience of a lifetime. No superlatives can do this culinary experience justice. With only enough space to seat 15 people, the line forms outside well before Nic starts spreading lunchtime smiles at 11:00 (opens at 7:00 for breakfast). Be early, or wait around until closer to the 2:00 closing. And if you order the burger for take-out, be prepared to eat it in your parked car – that’s as far as you’ll get. Nic’s was featured on the Food Channel’s hit series, Diners Drive-ins and Dives. 1201 N. Pennsylvania Ave. 73107; 405.524.0999. There are NO call aheads for takeout orders and Nic takes weekends off. Metro Wine Bar & Bistro. Go for the bread. Try to maintain room for the food. And if you’re part of the early evening crowd, ask the waiter when you walk through the door to put the bread in the oven. My pick for a special dinner. 6418 N. Western Ave. 73116; 405.840.9463; www.metrowinebar.com. Rococo Restaurant. Start at the bar gazing at the gargantuan jar of pineapple slices steeping in vodka and proceed from there to the Fisherman’s Stew. 2824 N. Pennsylvania Ave. 73107; 405.528.2824; www.rococo-restaurant.com . Iron Starr Barbeque. Try the pulled pork sandwich (topped with cole slaw) or the bacon wrapped quail breast. And always no matter the entrée, order the side of fried okra. The small, tender pods are fried whole. Oh! 3700 North Shartel Avenue 73118; 405.524.5925; www.ironstarrbbq.com . Deep Deuce Grill (as opposed to the Deep Fork Grill – also good, but…). Cozy gas lamps. I n the historic deep deuce hotel and historic jazz district; 307 Northeast 2nd Street 73104; 405.235.9100; www.deepdeucegrillokc.com. Downtown is still what sets our major cities apart and Oklahoma City is no exception. 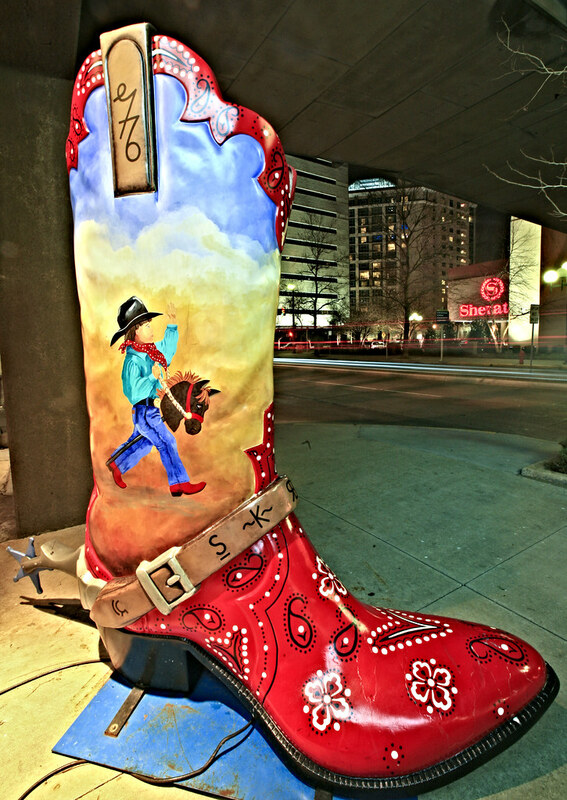 Stay downtown and wander around after dark. There are unimaginable surprises. Bricktown is but one. The Colcord Hotel became Oklahoma City’s first skyscraper when it was built in 1910 by Charles Francis Colcord. Ninety-six years later, a $16 million renovation by The Coury Collection transformed the 12-floor building into an upscale boutique hotel. Large scale construction was going on in an adjacent lot when I visited late-March. Ask about it before you book a room. 15 North Robinson Avenue 73102; 405.601.4300; www.colcordhotel.com. The historic Skirvin Hilton Hotel is on the National Register of Historic Places and garners AAA’s Four-diamond rating. 1 Park Avenue 73102; 405.272.3040; www.hilton.com. Marriott’s Renaissance Convention Center Hotel. Another AAA Four-diamond hotel in the heart of downtown. 10 North Broadway 73102; 800.468.3571; www.renaissanceoklahomacity.com. The Sheraton Hotel. Consistent. Modern. Excellent value. Nice people at the front desk. 1 North Broadway Ave., 73102; 405.235.2780; www.sheratonokc.com. Oklahoma City Museum of Art; closed Mondays; Tuesday – Saturday 10:00 – 5:00; Thursdays 10:00 – 9:00; Cocktails on the Skyline in the Museum Café, Thursday 5:00 – 10:30; 415 Couch Dr 73102.; 405.236.3100; www.okcmoa.com. Chihuly Glass Sculpture, “The Eleanor Blake Kirkpatrick Memorial Tower”. 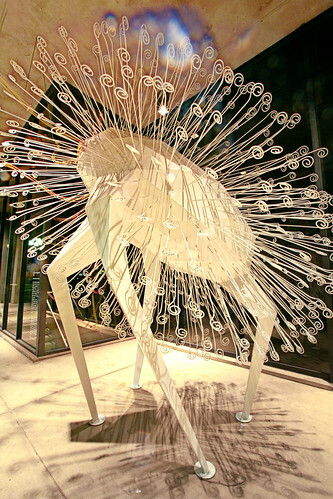 Dale Chihuly’s largest permanent exhibit can be found at the Oklahoma City Museum of Art (see above). At 10 tons and 55 vertical feet of writhing, jewel colored blown glass by world renowned glass sculptor Dale Chihuly, the tower piece is illuminated 24 hours a day. Best appreciated by night. The Underground. A three-quarter-mile tunnel system that links 16 blocks and more than 30 buildings in downtown. The original tunnel link was built in 1931 because William Balser Skirvin wanted to have an underground passage from his Skirvin Hotel on one side of Broadway to his new hotel, The Skirvin Towers, on the other side. Most of the remaining system was developed in the 1970’s. The Invited Artists Gallery sits beneath the intersection of Robinson and Robert S. Kerr with entrances from all adjacent buildings. “Galaxy”. 14 tons of “Liberman Red” sculpture. 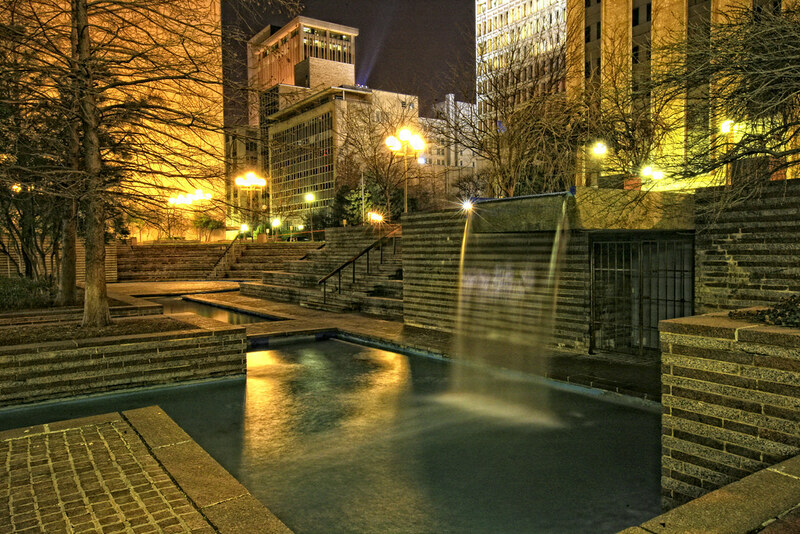 Leadership Square (just across the street from “1889” sculpture). “1889”. 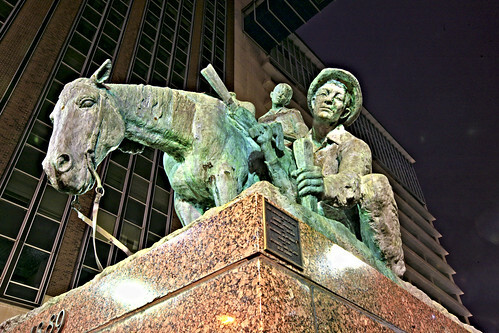 Dedicated in 1960 and commissioned by the Kerr McGee Corporation, this bronze inspires. At the intersection of Robinson Ave. and Couch Drive. The “Galaxy” is right across the street. Air Force Monument. Erected in 1964 the monument pays tribute to the U.S. Air Force. Couch Park. “The Curious Organism”. Created to pique the public’s curiosity about The Underground (see above). The tentacles extend more than 100 feet into the tunnel system. NE corner of Broadway & Robert S. Kerr. State Capitol. 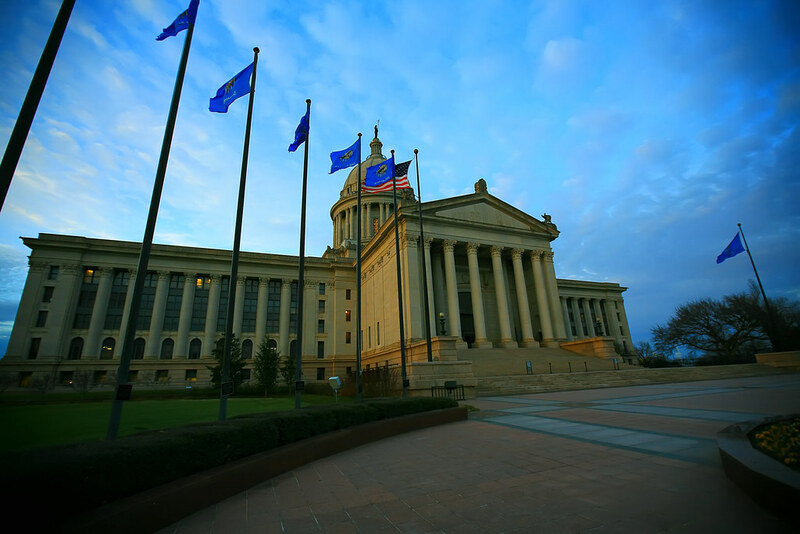 Check out the oil wells and the 17-foot tall bronze Native American statue “The Guardian” on top of the dome honoring Oklahoma’s Native American heritage. 2300 N. Lincoln Blvd. 405.522.0836. www.ok.gov.oklahomadome.com. Land Run Monument. A must-see. Moving. Southern edge of Bricktown on the Canal (far side of Bass Pro’s parking lot). www.crownartsinc.com. Oklahoma National Memorial and Museum; open 24/7; 620 N. Harvey Ave.; 888.542.4673; www.oklahomacitynationalmemorial.org. Automobile Alley was a popular retail district in the 1920’s and was home to most of the city’s car dealerships. Today a stroll through the area will take you past the art deco architecture tucking away galleries, upscale lofts, and offices. North Broadway Avenue from West Park Place (just north of 10th Street) to NW 4th Street. www.automobilealley.org. The Paseo Arts District. Located at 28th & North Walker to 30th & North Dewey is the oldest Arts District Community in Oklahoma City. The Spanish style architecture is home to a vibrant group of artists with substantial involvement and support from the larger community. They continue to build the district into one of the most creative art venues in the country. The Paseo is home to 17 galleries and more than 60 artists, all within walking distance. Intermingled with the galleries are restaurants, a coffee house, clothing boutiques, gift shop, yoga studio and graphic arts studio. Annual artist festival Memorial Day weekend. 405.525.2688. 50 Penn Place. 1900 NW Expressway, 73118. 405.848.7588. www.50pennplace.info. Penn Square Mall. The one and only and still slightly infamous. Intersection of Pennsylvania Avenue and NW Expressway. 405.842.4424. The Consortium. Home. Clothing. 4415 North Western. 405.602.5005. “Cocktails on the Skyline” in the Museum Café. See address and hours above for the OKC Museum of Art. La Baguette at the Colcord Hotel. Now incorporates the Oyster Bar. 15 N. Robinson Ave., 405.601.3800. Interurban Express (for lunch or after work hour cocktails). 204 N. Robinson; 11:00 – 8:00, kitchen open until 6:30; 405.235.4448; www.iucityexpress.com. Makers Cigar Lounge. Home to a hidden, quiet cigar lounge. With leather couches and dark paneled walls. After dinner drinks or just a place to relax. 25 S Oklahoma; 405.606.9000. The Paseo Arts District (see above). Nonna’s Purple Bar. Fun. 1 Mickey Mantle Drive on the 2nd floor of Nonna’s Restaurant. 405.235.4410. www.purplebarokc.com. Really insightful….look onward to returning. Great information and some really cool pics. Helped immensely with my business travel in OKC. Just an update. The Interurban Express is closed, but one block away is a really cool choice, The Library of Food & Spirits. A cool, casual, hidden basement bar at 119 N. Robinson. Sign says it’s been there since 1989. People were awesome, food was great, drinks were stout and the prices were incredible. I think had you found this place it might have made your cut instead of Interurban. I was never there, but doubt it was cooler than this joint. Lived there for many years…great place…and your fantastic pictures and wonderful article make me want to move back!!! Wow…I have never been to OC…but it looks like a really cool place. I’ll definitely consider it for my next vacation!